The recent NSW FameLab finals event saw 10 early-career researchers take the stage at Sydney’s Powerhouse Museum, to explain their work – in three minutes or less – to a general public audience. FameLab is an international competition that seeks to uncover the best new voices of science and engineering across the world. This year, FameLab joined forces with Fresh Science, Australia’s own communicating science competition, in partnership with the British Council, to help scientists and engineers improve the way they communicate their science. Among topics covered by NSW finalists were an ‘opal treasure map’, developed by Andrew Merdith, which identifies areas where the gems might be efficiently mined. Ali Fathi’s cartilage-repairing injectable gel promised to do away with open surgery and a forensic method for identifying abuse to animals by Dr Lydia Tong. NSW Judges were UNSW ecologist Dr Angela Moles who last year won the prestigious Frank Fenner Prize for Life Scientist of the year, New Scientist journalist Michael Slezak and British Council Deputy Director Kirsten Freeman. 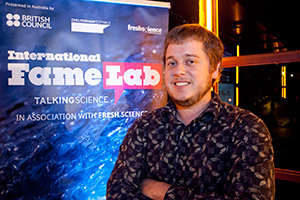 All were unanimous in their decision to appoint Dr James Makinson from University of Sydney’s School of Biological Sciences as NSW’s FameLab winner. James is a Postdoctoral researcher at the University of Sydney. His work explores the nesting habits and decision-making processes of the Asian Dwarf Honeybee. “I’m really excited to have made it into the FameLab Australia nationals,” said James. “Learning about how the media operates and what my colleagues from other institutions are up to has been a rewarding experience in itself. While James found being assessed by such luminaries as Angela Moles intimidating, he was pleased that he managed to pass on some of his enthusiasm for Asian honey bees to the panel. James is now looking forward to the next round of the competition: being trained up for the FameLab Australia Final in Western Australia in May. The ultimate FameLab Australia winner will then represent their country in the international FameLab event to be held at the Cheltenham Science Festival in June.